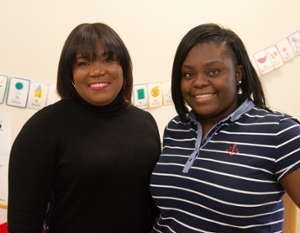 Kei’lah Brown-McGee, of Belleville, has wanted to help, love and educate young children for some time, and Southern Illinois University Edwardsville East St. Louis Center’s (ESLC) Workforce Development Program has helped place her in the front of the class. Brown-McGee is part of a two-year Child Development Associate (CDA) Apprenticeship program, which is one of the few in the U.S. The apprenticeship program is offered by the Lume Institute, in partnership with ESLC. To be able to participate in the program, Brown-McGee received tuition assistance through St. Clair County Intergovernmental Grants. She is currently receiving on the job training funded by St. Clair County Intergovernmental Grants Workforce Investment and Opportunity Act Funds. “Within one year, this program helped me obtain my CDA certificate and allowed me to become a teacher’s assistant at the Discovery Center,” said the 21-year-old. Brown-McGee works with lead teacher Jatona Skinner. At the Discovery Center, Brown-McGee works with children ages 3-5 and helps in supporting the implementation of developmentally appropriate lesson plans, promoting individualized classroom instruction and assisting with classroom behavior management. She also supports the completion of developmental screenings and assessments and participates in home visits and parent-teacher conferences. “The children are more excited to see Kei’lah enter the room than they are me,” said Skinner. 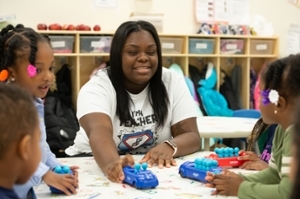 Photos: Working in a job she loves, Kei’lah Brown-McGee is a teacher’s assistant at the SIUE Head Start/Early Head Start’s Discover Center for Little Scholars. Brown-McGee (right) learned about the SIU East St. Louis Center’s Workforce Development’s Child Development Associate (CDA) program from Vera Jones (left) Workforce Development career counselor.